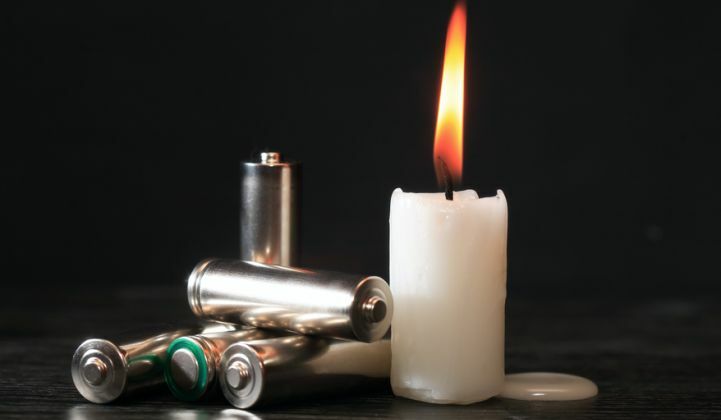 Battery storage is still “many years away” from preventing massive blackouts such as the one that hit South Australia last month, according to a senior utility figure. On September 28, a severe storm caused a cascade of grid failures, leading to a statewide loss of electricity. After the incident, some wondered if battery storage could have helped keep the network running. But Stephen Devlin, the general manager for energy networks at ActewAGL Distribution, whose network was affected by storms, said that storage contributions are dependent on the broader system operation. “The major factor is the resilience of the physical network,” said Devlin. “Energy storage would still be affected by network outages, and their contribution could be limited by the network configuration that will be available at the time. There would need to be a high percentage of energy storage devices to have a significant impact." Nevertheless, demand for storage is expected to increase after the entire state of South Australia lost power last month. “The electrical outages caused by severe storms, both in South Australia last month and in Victoria last week, have resulted in a spike in Australian households inquiring about battery storage for security of supply,” reported One Step Off The Grid, a consumer information website. And after the event, Natural Solar, a New South Wales-based installer, highlighted how its customer Brian Gillespie had kept lights on in South Australia thanks to backup power from a Tesla Powerwall. “The blackouts have raised the awareness of battery storage,” Devlin acknowledged. They have also focused public attention on Australia’s future generation mix and the policy decisions required by government, market regulators and industry investors to provide a secure, reliable electricity supply, he said. In particular, the blackout triggered intense debate over the role of wind power in grid resilience. Politicians quickly linked the grid failure to the high levels of renewable energy in the South Australia electricity system. A report by the Australian Energy Market Operator (AEMO) indicates wind power, which makes up 40 percent of the energy mix in South Australia, did have a role to play in the blackout. AEMO discovered nine wind farms went offline simultaneously as the storm front hit, causing 445 megawatts of demand to shift to an interconnector that became overloaded and then disconnected from the grid to avoid being damaged. Although there's been much debate about how much wind is to blame, it's clear that the grid operators did expect the wind projects to ride through the storm. “The instantaneous loss of 900 megawatts of supply across the Heywood Interconnector could not be met by the generators remaining online within South Australia,” said AEMO. “The sudden and large deficit of supply caused the system frequency to collapse more quickly than the Under-Frequency Load Shedding scheme was able to [take action], resulting in the South Australia black system." Australian wind farm operators are reportedly reviewing plant settings to make sure a similar event does not happen again in the future. Behind-the-meter and network-connected battery storage could potentially help deal with similar situations, Devlin said. But currently the scale of deployment is too low to have a significant impact. Energy storage was expected to increase significantly in the region over the next few years, Devlin conceded, particularly as a result of the ACT government’s next-generation storage pilot. The pilot started in April and aims to support rollout of 36 megawatts of battery storage across 5,000 homes and businesses by 2020. ActewAGL Distribution is participating in the pilot with trial installations using Panasonic batteries. ActewAGL Distribution has also been actively involved with real estate developers within Canberra to analyze the feasibility of installing network batteries in new residential developments, said Devlin. But he said it was too early to expect batteries to save Australian businesses and homeowners from further blackouts.